At E-Commerce Tutor we have a vision, we want to educate people on how to sell their products and services online. Our videos cater to everyone no matter what level of experience you have. We will discuss all of the different costs associated with starting an e-commerce business to help you save time! While there are several marketplaces you can sell your products online we will teach you how to build your brand online! We will teach you what Facebook Ads and Instagram ads to run so your online store will be successful. 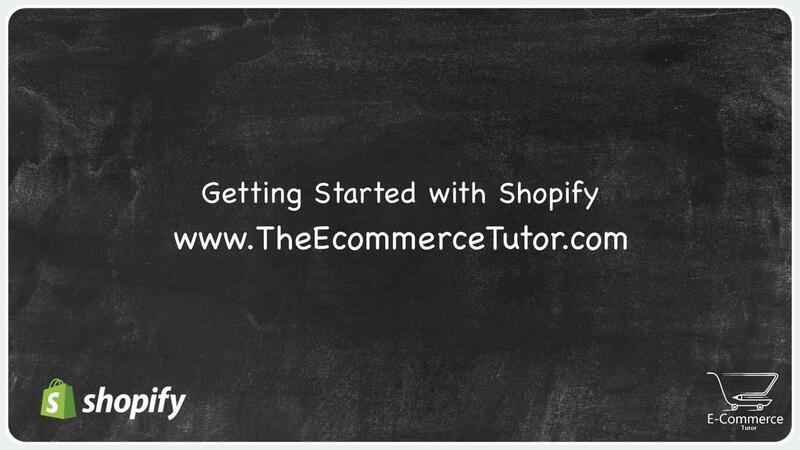 By taking these classes, you'll get the complete A-Z program on building an Shopify E-commerce store. It's the first of its kind that gives you the full blueprint... so no matter what your level of expertise is, you can bet you'll find success. We’ll teach you how to take your products and services and transform that information into high converting product pages that will make people want to buy. We’ll show you everything you need to know about the intricacies of running an online business today, selling products, and growing your brand through various channels. Also, we'll show you how to find your perfect customer and build relationships with them to turn them into your customers. Finally, we'll show you how to build a e-commerce website that sells your products or services so you can make money in your sleep. By the end of our time together, you'll be well on your way to achieving financial freedom and building a business of your dreams! Try Shopify free for 14 days, no credit card required. Trusted by over 800,000 businesses worldwide. A MeetUp group for anyone interested in learning how to use the Shopify Ecommerce platform. My goal is to educate Entrepreneurs and Businesses so their new online store can help them generate more revenue and gain new customers. "Jimmy is a very helpful educator. He continues to share meaningful experiences and is especially helpful with understanding Shopify to reduce the learning curve. What he has shared can not be found in a book or within online help. Thank You, Jimmy and keep up the GREAT contribution in your public presentations/training sessions." "Jimmy has been a tremendous asset in helping me build my business. Between his advanced tools, extended network, and 10+ years experience in an industry filled with charlatans, having someone like Jimmy on your team is a necessity." "Jimmy is the real deal. He knows what he is doing from first hand experience and he is truly interested in making sure you succeed. Pricing is fair and he throws in plenty of free advice and tips." "Jimmy helped me get my first sale in my online Shopify store! I highly recommend his expertise to anyone. He gave me a tremendous amount of help and expanded my knowledge on my online store!" "I had a great time at the meetup learning the process for setting up Facebook Business Manager and several helpful marketing apps and tips. The host was very knowledgeable and professional while relaying his experiences on the subject matter. Several people were engaged with questions throughout the event. I would definitely add recommend this service to anyone looking to get started in e-commerce." "I love this company. They helped me from A-Z and with anything I had a question about. This was one of the greatest investment I made for myself. Very customer friendly. Highly recommended in my book." "I'm definitely satisfied with the service that he provides. Not only his services but his willingness to share his wealth of knowledge with those that are willing to learn. I truly appreciate who you are and hope to do more business and/or projects with you. " SUBSCRIBE FOR SHOPIFY EVENT NOTIFICATIONS! CLICK HERE FOR EVENT NOTIFICATIONS! Please fill out information as complete as possible. We will only use this information for event purposes.